The news landed like a bombshell. 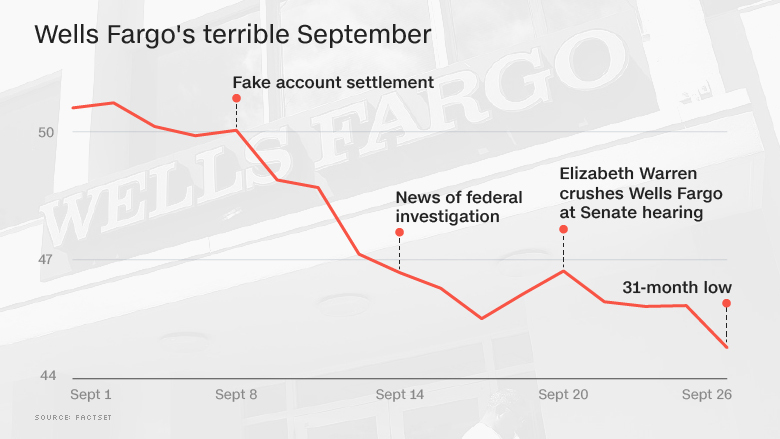 On September 8, Americans learned that Wells Fargo had fired 5,300 employees for secretly creating as many as 2 million unauthorized accounts since 2011 and was paying a penalty of $185 million. Angry lawmakers almost immediately launched Congressional hearings. The Department of Justice fired off subpoenas, kicking off an investigation. The Labor Department started a "top-to-bottom review" of labor violations, including wage-related and whistleblower complaints. 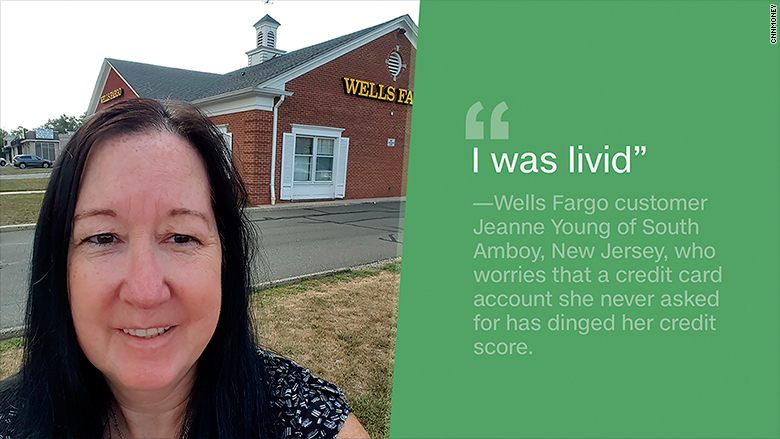 Dozens of fuming former Wells Fargo workers reached out to CNNMoney to share horror stories of the pressure-cooker environment that led to this sordid behavior. Some said they had been fired for refusing to engage in these illegal practices, while others said they were fired for blowing the whistle. Lawmakers were livid. They called Wells Fargo a "criminal enterprise" guilty of a range of crimes, including conspiracy to commit fraud and racketeering. 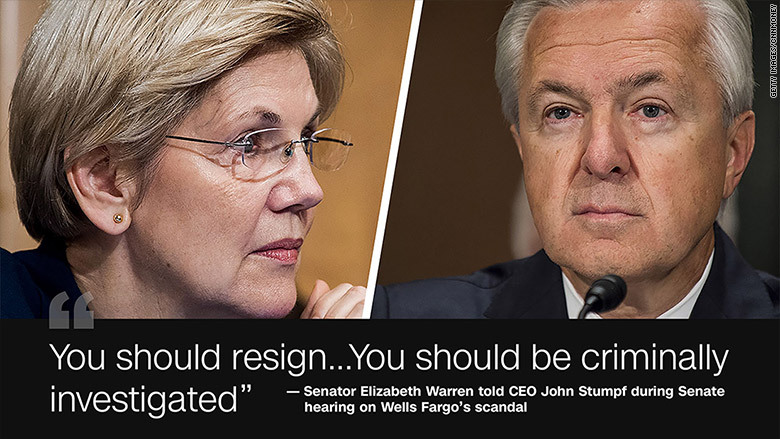 One even compared Wells Fargo to the notorious Enron. 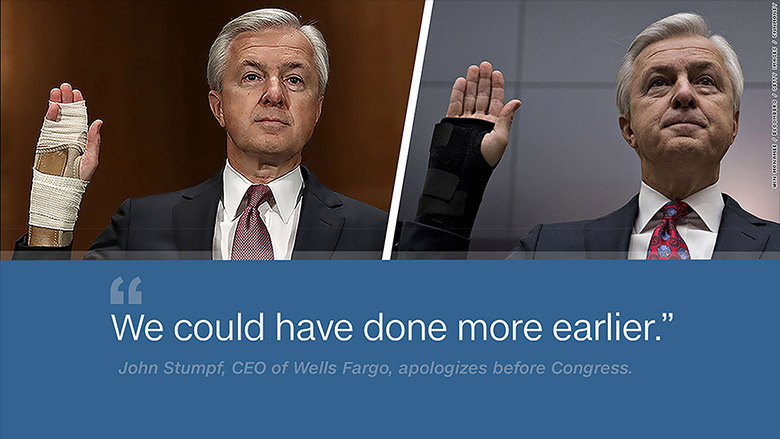 Wells Fargo CEO John Stumpf did the unthinkable: unite Congress. He could barely get a word in as lawmaker after lawmaker -- Republican and Democrat -- heaped scorn on him at two separate hearings in front of the Senate and House. 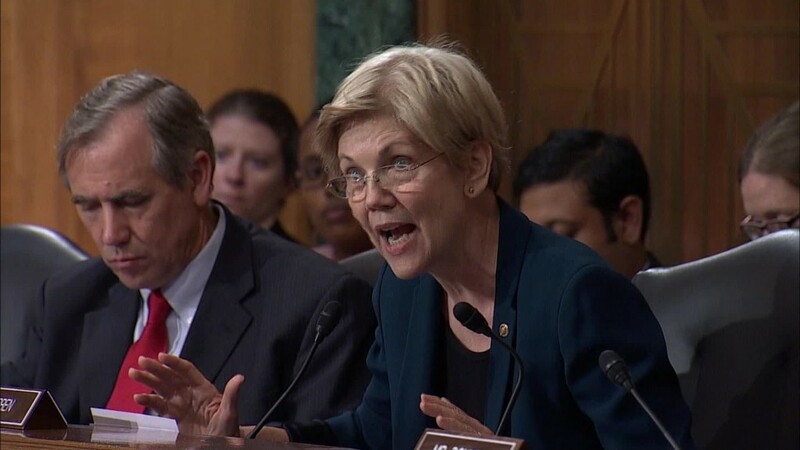 In an epic takedown, Senator Elizabeth Warren called him "gutless" and said: "You should resign...You should be criminally investigated." Late-night hosts like Stephen Colbert and John Oliver had a field day, at times citing CNNMoney's coverage. 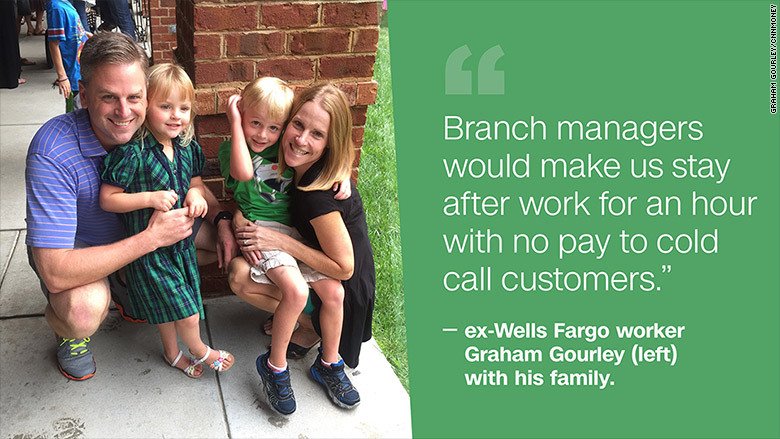 Customers like Jeanne Young were angry. 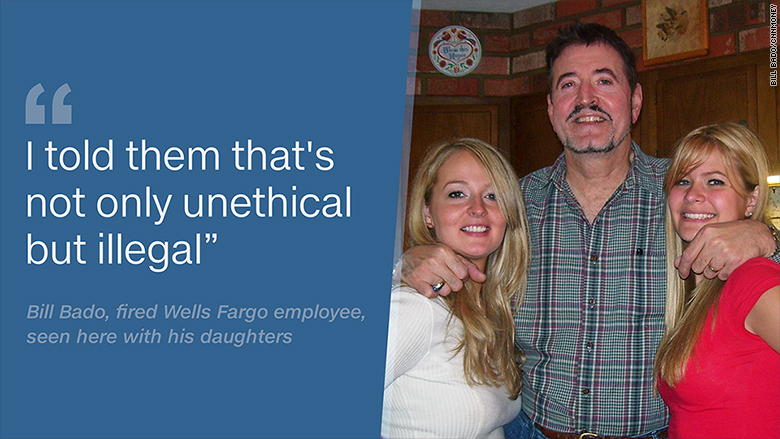 And former Wells Fargo workers say the bank's notorious culture led to forced overtime -- without pay. 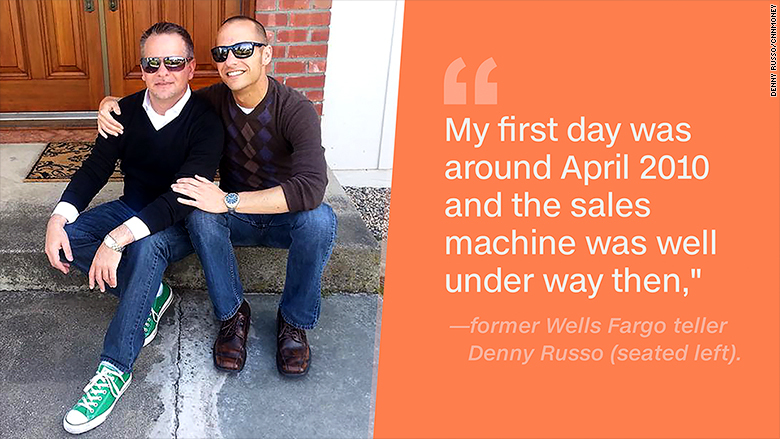 Almost a dozen workers told CNNMoney that Wells Fargo was opening unauthorized accounts earlier than the 2011 timeframe the bank has admitted to. 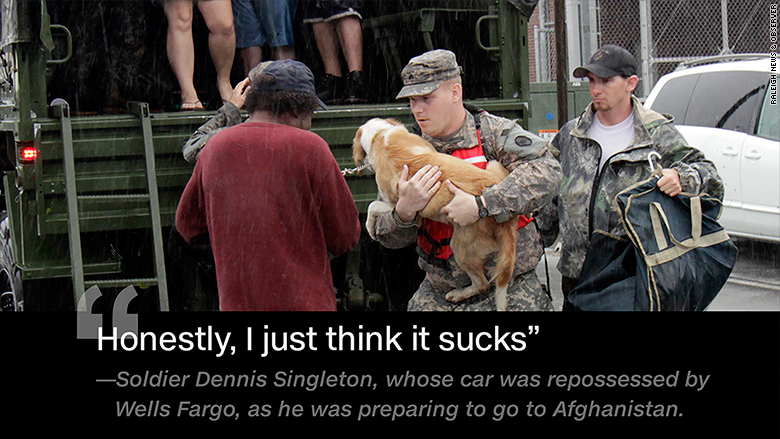 As if things couldn't get any worse, on Thursday, Wells Fargo was slapped by the Justice Department with a fine of $24 million for mistreating members of the military by illegally repossessing their cars. 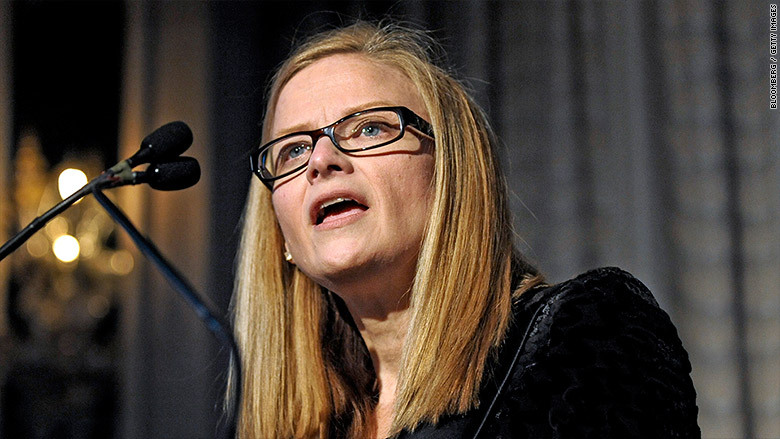 Carrie Tolstedt, the executive who led the division that created fake accounts, was forced out of the company a few months before her scheduled retirement. Some of her pay was clawed back. But she could still walk away with a fortune of $77 million. --Caroline Matthews, Ian Berry and Allie Schmitz contributed to this report.